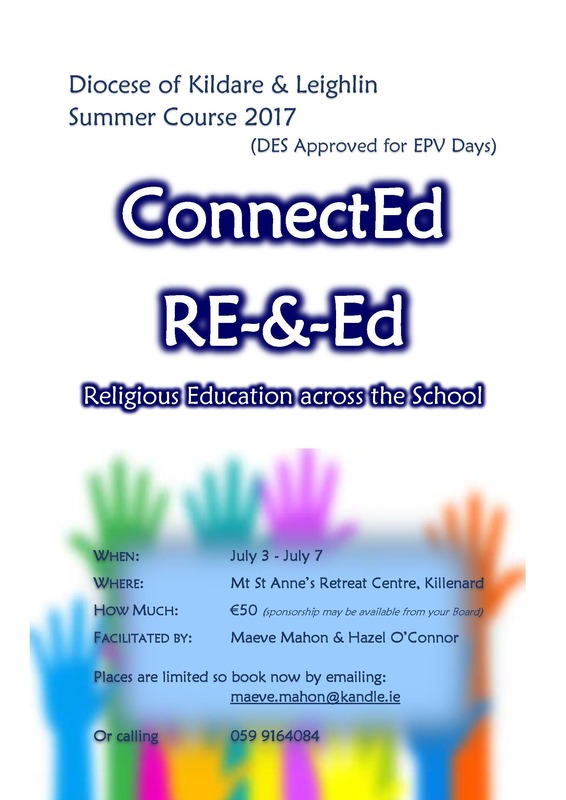 Last year the diocese received approval from the Department of Education and Skills, for the first time, for a Summer Course entitled ‘ConnectEd; Religious Education Across the School’. The course was very well received by the 26 participants and we are delighted to be able to offer it again this year. This Summer Course will take place in Mt St Anne’s Retreat Centre, Killenard, from Monday, July 3 – Friday, July 7 and will be facilitated by Maeve Mahon and Hazel O’Connor. The Course will begin at 9:30 a.m. and conclude at 2:00p.m. Lunch is included. The cost of the course is €50 and Boards of Management have been asked to consider sponsoring a teacher. For further information or to book a place please contact Maeve at maeve.mahon@kandle.ie or 059 9164084.